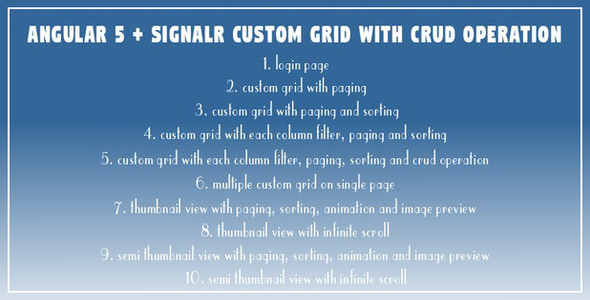 “Angular 5 + SignalR Custom Grid with CRUD Operation” is a fully custom dynamic grid, thumbnail and swmi thumbnail grid. This entry was posted in net and tagged angular 2, angular grid, animation, bootstrap grid, bootstrap model, column filters, crud operation, custom grid, dynamic grid, html grid, individual filtering, infinite scroll, paging, sorting, thumbnail by dadmin. Bookmark the permalink.